If your current continuity meter is a battery, a resistor, and an LED ... instead make it a battery, a larger resistor, and a pair of headphones. It'll click instead of beep when you make contact, but I've found that it's still good enough. With what software were those schematics made? I see a lot of similar looking ones for the Game Boy from the 1990s. 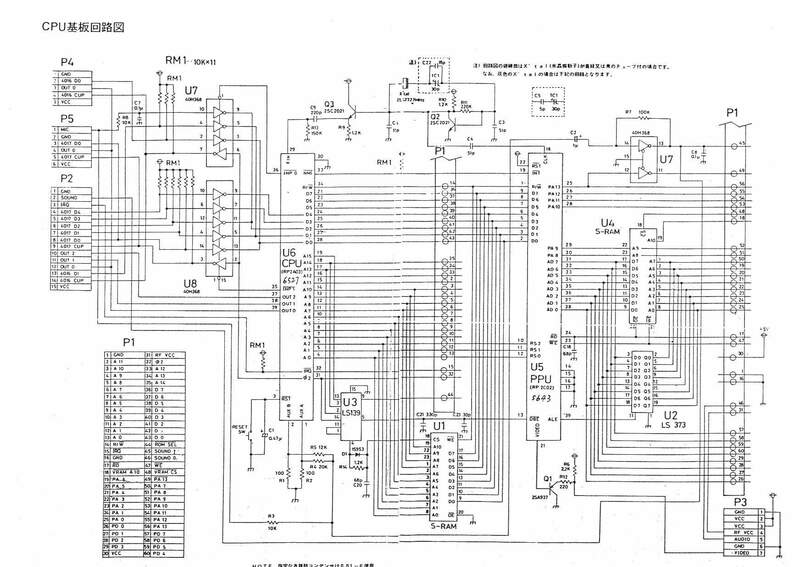 I'm not sure, but I'll ask Jeff Frohwein, who made the gb schematics (i.e. http://www.devrs.com/gb/files/gameboy1.gif ) with that software. Answer: an absolutely ancient DOS version of ORCAD DRAFT.EXE (from 1986) was used to create those schematics. Here is my ultimate AV Famicom restoration mod, which solves the microphone problem and the zapper/vaus problem. The Famicom Expansion Port can support a NES Zapper/VAUS as if it were plugged into Controller Port 2 with a homemade adapter. You can make one with a NES Controller Extension Cable and a Neo Geo Controller Extension Cable. No modification to the console is necessary for this step. I have not done this of course, but it should work. From the Famicom expansion port, you need pins 1, 4, 5, 9, 12 & 15. These go to GND, CLK, OUT, D3, D4 & +5V on the NES controller port. So with that adapter done, the extra two pins of the AV Famicom's second controller port are now open to you. The microphone uses $4016 D2. You cannot implement this through the BU3266/3270, it only has as many inverter gates (9) as it was designed to need. So you need a 40HC368 chip, which gives you 6 extra inverters. The chip will convert D2 into $4016 D2. This leaves you with five more gates. You could use two of those to restore 4016 D3 & D4 to Controller Port 1, but you will need 10K pullup resistors as shown in the schematic. The unlicensed game Chiller can use two Zappers, as can the homebrew called Zapper PONG. Xmas 2011 and Quadralords can use a VAUS in Controller Port 1. Any unused inverters should have their inputs wired to ground. You could use one of the inverters to restore the relative internal/external volume levels of the original Famicom. Someone on the krikzz forum stated that the AV Famicom's internal volume level is lower than the original Famicom's because the BU3266/BU3270 only outputs 3.3v and the 40HC386 outputs 5v. I am not sure I believe that. Finally, with the spare end of the NES Controller Expansion Cable you used for the Zapper adapter, you can wire it up to a Famicom Controller II for your microphone! Sorry for unearthing that topic. I would like to know if anyone tried the method explained by Great Hierophant? I'm very curious to know the result of it. Anyone also did some pictures for people like me who are less knowledagble in electronic? Thanks for the topic it's so interesting.